A radiant Hollywood legend from Ireland, Japan’s pioneering animation storyteller, a maestro of the written word from France, and an inspiring humanitarian raised in Jamaica and New York were given a spectacular toast at the Academy’s 6th Annual Governors Awards on Saturday, November 8, 2014, at the Ray Dolby Ballroom at Hollywood & Highland Center® in Hollywood. Among those in the star-studded audience were Jennifer Aniston, Emily Blunt, Chadwick Boseman, Jessica Chastain, Kevin Costner, Marion Cotillard, Benedict Cumberbatch, Robert Downey Jr., Robert Duvall, Danny Glover, Jake Gyllenhaal, Ron Howard, Felicity Jones, Michael Keaton, Keira Knightley, John Krasinski, Eddie Redmayne, Mark Ruffalo, Andy Serkis, Jenny Slate, Octavia Spencer, Tilda Swinton, Justin Theroux, Christoph Waltz, Reese Witherspoon, and Oscar producers Craig Zadan and Neil Meron. O’Hara was welcomed to the stage by another screen favorite, actor and Oscar-winning director Clint Eastwood, who told a story about being cast in an O’Hara film as a young man, with one line of dialogue. He was awestruck during the scene, in which O’Hara appeared astride a horse. “She’s the ultimate Irish lass,” he said, as he welcomed O’Hara onstage to the strains of “Danny Boy” – which the star continued to sing herself. Toy Story filmmaker John Lasseter offered a heartfelt introduction for the next Honorary Award recipient, Hayao Miyazaki, of whose films he said, “They have moved me, they have inspired me, and they have helped shape me as a filmmaker.” He shared a story about his early days working at Disney, where he experienced an awakening while seeing Miyazaki’s first feature film as a director, The Castle of Cagliostro, and its “wonderful eye for the details of human behavior.” Like Walt Disney, Miyazaki proved “that animation truly was for everyone.” Lasseter even found the love of his life through the film, when he showed Cagliostro to his future wife and she was thrilled by it too. Few would disagree with Lasseter that every Miyazaki film is a masterpiece, including such beloved titles as My Neighbor Totoro, Princess Mononoke, Howl’s Moving Castle, The Wind Rises and the Oscar-winning Spirited Away. The two men shared a hug and a handshake during the statuette presentation, and Miyazaki accepted his Oscar by noting, “My wife tells me that I am a very lucky man. I think I’ve been lucky because I’ve been able to participate in the last time you could make films with paper, pencil and film.” Furthermore, he felt another great reward tonight was being able to meet Ms. O’Hara. The prolific and inventive Jean-Claude Carrière has been nominated for three Academy Awards for his screenplays, for the surrealist comedies The Discreet Charm of the Bourgeoisie (which won the 1972 Oscar for Foreign Language Film) and That Obscure Object of Desire, both with director Luis Buñuel; and the acclaimed film adaptation of the classic novel The Unbearable Lightness of Being, with director Philip Kaufman. He also won an Oscar for Live Action Short Subject for Heureux Anniversaire (Happy Anniversary) in collaboration with filmmaker Pierre Étaix. Carrière’s Honorary Award was presented by Kaufman, who remembered the 2,000 times they ate together (“more than most couples”) while working on their film. A fateful visit to the mud baths gave them the key to the characters in Unbearable Lightness, leading to the indelible portrayals in the finished film. He also related a hilarious anecdote about how he inadvertently discovered Carrière’s ability as a cartoonist, thanks to an oddly inspiring drawing of two walruses. He also touched on Carrière’s impressive work as a novelist and playwright, displaying a talent that knows no boundaries. The day also happened to be Carrière’s daughter’s birthday, and he wished her a happy one at their table. He looked back on the many legendary directors he has worked with, many no longer with us, who all taught him something and remain present as he continues to work. Furthermore, he said he felt “they are all here with us tonight.” In a poignant final moment, he expressed his wish to share the award with screenwriters everywhere, those he knows and those he has yet to meet. The final award of the evening, the Jean Hersholt Humanitarian Award, was presented to Harry Belafonte, a music performer, actor and activist whose accomplishments range from recording beloved standards like “Day-O” and organizing the multiartist collaboration on the benefit song “We Are the World” to changing the world alongside his friend Dr. Martin Luther King Jr. as part of the civil rights movement in the 1960s. He has continued to do his part for people around the world as a cultural advisor for the Peace Corps, a UNICEF Goodwill Ambassador, and the founder of the Sankofa Justce & Equity Fund. The award itself was presented by Oscar-winning actress Susan Sarandon, who hailed the “warrior on the battlefield for social justice” and veteran of fights against apartheid, world hunger and injustice around the world. “I love you, Harry,” she said to the brave artist and a lifelong social activist who continues to inspire us all. 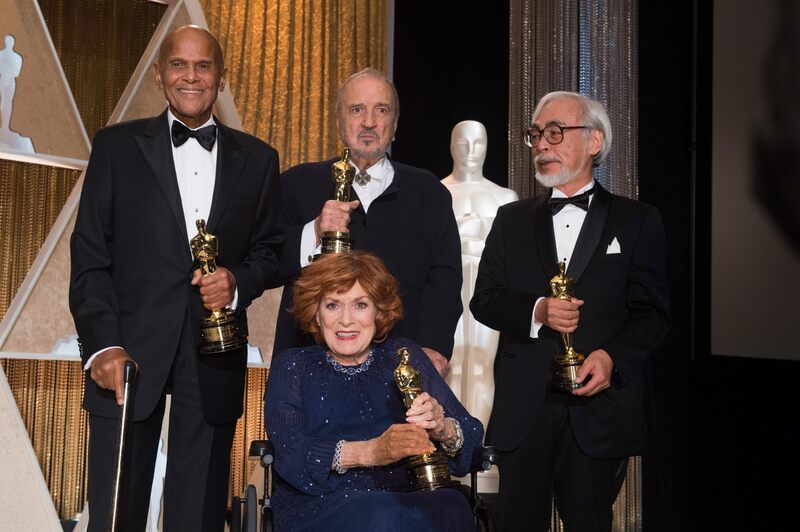 Honorary Awards were presented to Jean-Claude Carrière, Hayao Miyazaki and Maureen O’Hara, and the Jean Hersholt Humanitarian Award to Harry Belafonte in The Ray Dolby Ballroom at Hollywood & Highland Center® in Hollywood, CA, on Saturday, November 8, 2014.